The last few months have brought as a lot of scares and I am not talking about the recent events of Halloween. 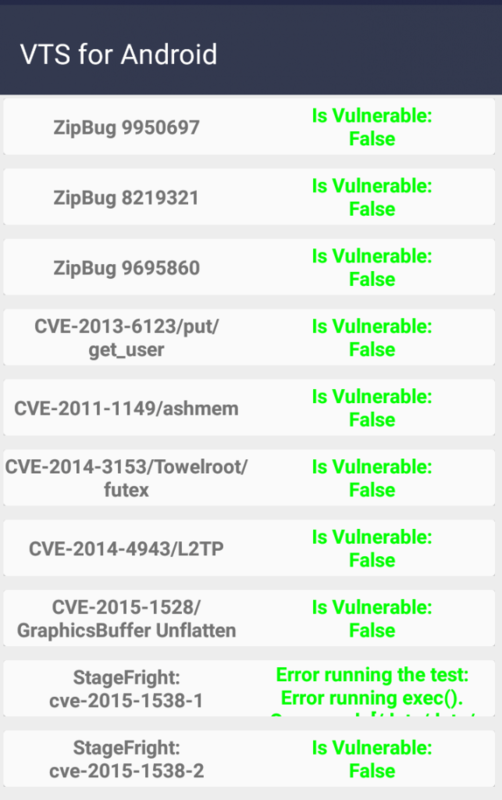 Major security vulnerabilities were discovered on Android and word circulated very quickly. 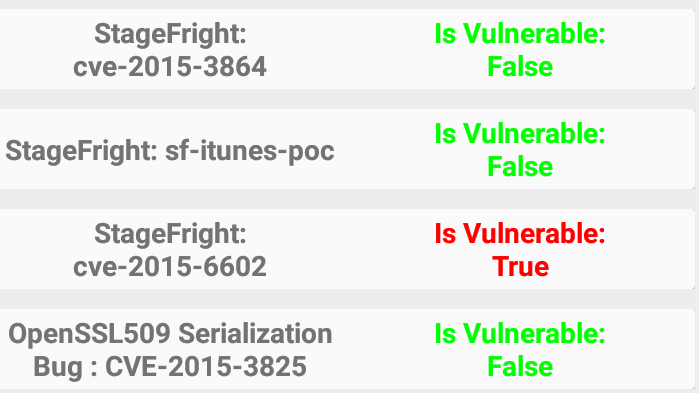 Now, most people who visit at least one website like ours have heard of things like Stagefright. Despite that, many still do not know whether their devices are affected or not. Even worse, most people do not care enough to fix these kinds of issues, especially when the process of checking for vulnerabilities is convoluted. Scaring people by talking about security holes is one thing but actually showing them that their device is vulnerable may entice them to actually fix them too. 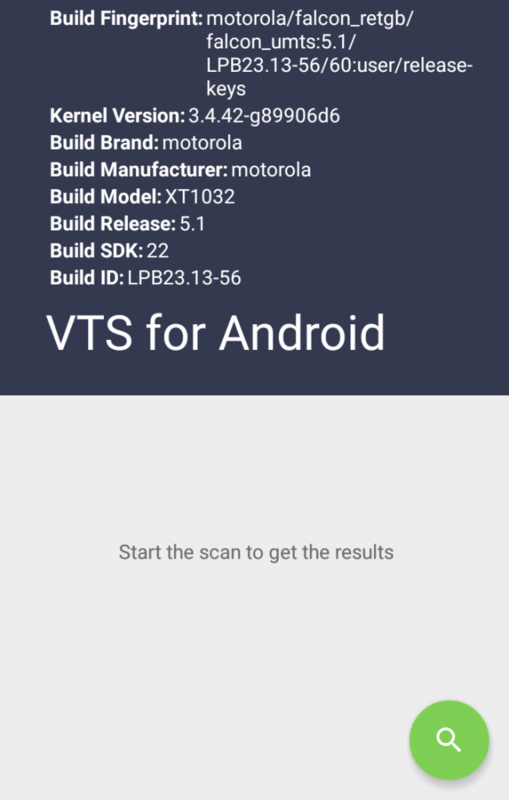 One of the best ways to do that is with VTS for Android, a free and open-source app by NowSecure that can instantly inform you about the security status of your device. VTS stands for Vulnerability Test Suite and the app itself is best described as an on-device test for vulnerabilities. Note that some devices may get security warnings with VTS but that is because of the methods it uses to check for vulnerabilities. The app’s source code is freely available for anyone to view and check while NowSecure, the developer behind it, is a well-established name in the mobile security industry. I believe that these two facts alone are enough to trust the app but the final decision is yours to make. After downloading and installing the app, open it and wait for a bit as it will automatically gather basic system data. Then, click on the search icon at the bottom right corner and the app should test for every known vulnerability. It is very easy to see whether your device has passed or failed the test but that is about everything you can do with the app right now. What is missing here is a way to get information about the vulnerabilities with a single tap but that is unfortunately beyond the scope of the app. If you find that your device is vulnerable to any of the listed items, the very first thing you should do is search for a fix online. We have already shown you how to protect yourself from major threats like Stagefright but the list of vulnerabilities is huge and we cannot cover everything. I am more than happy to help with any questions though so feel free to drop a comment down below or visit the forum for more in-depth discussions.